If you’ve followed me on Instagram for any length of time, you’ll know that I have feelings about the mountains of fleece that can be found in fabric+craft stores near the holidays. I wouldnt’t consider myself a claustrophobic person, but my local chain fabric store is fairly small and really maximizes the vertical space. It feels like fleece towers and is not my favorite experience. I thought for a long time about which pattern I wanted to make with this fabric but ultimately settled on a pair of knit joggers. I looked around online for a jogger pattern but was having a little bit of trouble finding something that came in my waist/hip size and wouldn’t require grading. I decided that I would not buy a pattern that I needed to grade up because for 2019 I want to put my money into pattern designers that acknowledge women of my size who want to sew beautiful patterns. This was before the declarations of many sewing pattern designers that have announced they will be expanding their pattern sizes after this important and extremely necessary discussion about the lack of inclusivity in independent sewing pattern company sizing. For a real understanding of this discussion, read the blog post and the comments on the Instagram account. Still, I am grateful, and will not forget the pattern companies that have already taken this initiative long before this past week to put in the good work on making inclusive, well designed patterns for a wide range of body types and sizes. The pattern that I chose is the Skye Joggers by Blank Slate patterns. The Skye Joggers go up to a 3X which is a 55'‘ hip but I definitely think women with a slightly larger hip could also still make this pattern as long as they choose a very stretchy knit fabric. Melissa, the designer for Blank Slate Patterns, has included a lot of photos of the Skye Joggers testers on her pattern website so you can see these pants in a variety of fabrics, styles, and body types. My bamboo/cotton fleece from Imagine Gnats Shop is very, very stretchy (and comfortable) and I probably could have gone down a size for a closer fit, although I’m very happy with how they have turned out. The benefit of sewing your own pants is that you can choose how you want them to fit! I cut out a 1X, and after measuring my own inseam I decided to shorten the pattern in the thigh and also in the calf. I could have either shortened the length at the bottom hem or made shorter cuffs as I have a bit of bunching at my ankles. But really—I don’t mind the bunching. These pants are extremely comfortable and warm and I see myself wearing them often around the house and for running errands with my kids this winter and spring. I used the matching ribbing for the cuffs and waistband. The ribbing has a lot of stretch and the entire length of the ribbing (which was knitted in a tube) was slightly shorter than my pattern piece size. I could tell from just holding the ribbing in the air that it would stretch more than enough to go around my waist so I didn’t cut it width-wise at all—it’s a tube! You could definitely piece together the waistband out of two cuts of the ribbing, but you may not need to either even if you sew a 2X or 3X and use a similarly extra stretchy ribbing. I hesitate to suggest sizing for other sewists but if your fabric is very stretchy in all directions (not just 2-way) and you are between sizes, I would recommend sizing down. 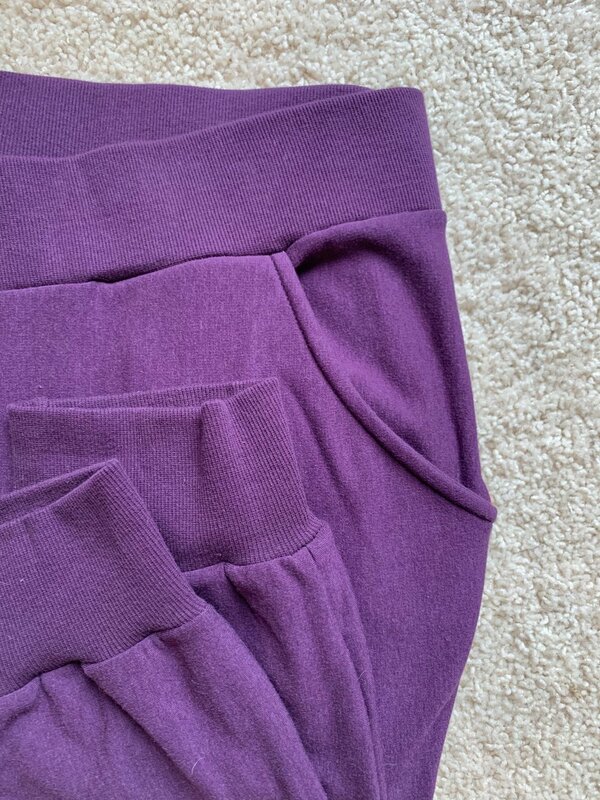 If your fabric is only two-way stretch and not exceptionally stretchy, do not size down. You’ll need the extra space to move and bend. Should you be worried about being able to jump in these pants, have no fear. They are tested and approved for jumping! I had no problems with the fit of the waist, hip, or crotch. My pattern pieces lined up perfectly and I made no alterations except for adjusting the length. If you are looking for a comfortable, classic jogger pattern, I would definitely recommend this pattern! I hope to use it again to make some more lightweight joggers for spring and maybe try sewing some cropped joggers! The pattern comes with full length and cropped length options. P.S. Are you a Seamwork subscriber? Seamwork subscribers receive discounts on many of my favorite fabric stores and IMAGINE GNATS is one of those stores offering a discount code to use anytime you order. So you can get a great price on any bottomweights, sweatshirting, and any other fabric from IMAGINE GNATS by checking out the Seamwork Fabric Discounts under the “Creative Tools” tab on their website. You must be a member and signed into your account to view the coupon codes. You can join Seamwork now for just $3 for your first month if you use my referral link. And I do have a Seamwork pants pattern to review in the next few days! So consider joining! Thank you so much for stopping by and checking out my “fancy pants” joggers. They felt fancy to me because of the vibrant color and they were a brand new-to-me pattern to try! I should have three or four more pairs of fancy pants to share with you this week if I can get everything photographed and shared. It’s incredibly cold here in Ohio right now and my photographs are not my normal well-lit, slightly interesting backgrounds. My living room will have to do. The benefit was that I got to put a record on the turntable and listen to some John Hiatt! You can follow along with my sewing and knitting in real time by following me on Instagram @makerheart. The deadline for sharing your makes on Instagram to qualify for the grand prize giveaways is coming soon! We will have two random grand prize drawings for people who use the hashtag #SewFancyPants and post anything on Instagram. The grand-GRAND prize drawing will be for those who post a #sewfancypantsdance on Instagram by the end of the day February 2, 2018 and the drawing will take place on February 3, 2018. To see a list of the prize sponsors, visit Loni’s Instagram post here.